Millions of Americans rely on Social Security Disability benefits to help them cope with the financial impact of a disabling condition that prevents them from working. Having SSDI benefits when you cannot work is essential, but unfortunately many people who are in desperate need of benefits are denied. If you are applying for Social Security benefits, there are certain things you can do to improve the likelihood of a favorable evaluation of your application. Applying for Social Security Disability benefits can be confusing, and the help of an experienced Social Security attorney is invaluable. The Indianapolis Social Security Disability attorneys of the Hankey Law Office, are prepared to help you at any phase of the process, whether you are preparing an initial claim or wish to appeal a denial. Contact us by calling (800) 520-3633 today to learn more. Document all medical treatment prior to applying and submit it with your application. Continue documenting and submitting any subsequent medical evaluations. Continue to stay on top of your case and be involved in its progress. Remain cordial and polite to employees of the Social Security Agency. Have your doctor fill out a Residual Functional Capacity form for you. Document your daily life in a journal that addresses how your disability affects your life. Note side effects or other difficulties. Promptly pursue an appeal if your initial claim has been denied. If you are disabled and unable to work, Social Security Disability benefits can make all the difference. 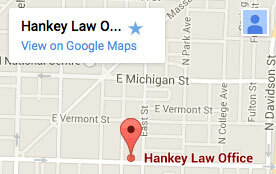 Contact the Indianapolis Social Security Disability benefits attorneys of the Hankey Law Office, at (800) 520-3633.